SITUATIONS is pleased to present the photography of Syeus Mottel (b. 1930-2014) in an exhibition titled CHARAS: The Improbable Dome Builders, opening August 4th and on view through the 26th. The show was curated with Ben Estes, of poetry imprint The Song Cave, in conjunction with their upcoming re-release of Mottel’s 1973 book of the same title. Through the lens of avant-garde architectural theory, Mottel’s work touches upon topics ranging from the morals of city planning and affordable housing, rehabilitation and education, public vs. private space, and the need to strengthen inner-city communities. Mottel documented many important figures of the 20th century including Martin Luther King Jr., Ornette Coleman, Thelonious Monk, John Cage, and the Silver Apples. However, the focus of this exhibition is on a project in which CHARAS, a group of six ex-gang members, built a Bucky Dome with directives sought from R. Buckminster Fuller. More than 100 photographs and slides documenting Mottel's time with CHARAS will be on display. In 1970 CHARAS held a meeting in an empty loft of a condemned factory building in the Lower East Side of Manhattan with R. Buckminster Fuller, the celebrated and revolutionary architect and inventor of the geodesic dome. CHARAS was interested in physically altering the housing conditions available in their immediate neighborhood, the Lower East Side. Unfortunately, their skills were basic and their educational background limited. After a few hours, and despite the seemingly impossible barriers between “Bucky” and CHARAS, they found themselves having an earnest and important conversation, and with the excitement and commitment between them all becoming apparent, the young men of CHARAS decided that they wanted to begin actively implementing Bucky’s ideas, and create a program to develop a sense of community autonomy, reclaim public space, and give their lives a new found sense of purpose. 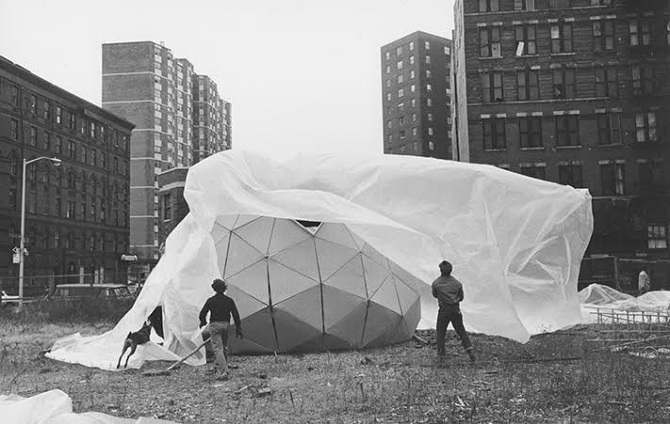 After a period devoted to the intensive study of solid geometry, spherical trigonometry, principles of dome building, and a myriad of related subjects conducted by Bucky’s assistant, Michael Ben-Eli, CHARAS broke ground to construct a geodesic dome for their community on an unused plot of land in the shadow of the Manhattan bridge. Mottel documents the trials and tribulations of getting the dome built, including CHARAS’s intensive training, search for funding, accidental fires, holiday potlucks, and Bucky himself coming to the building site to see their incredible work. The photographs reveal intimate portraits of these ex-gang leaders and drug addicts, turned community leaders, who found a new sense self through the applied philosophies of Buckminster Fuller. These photographs have a significant relationship to the gallery since the dome was built two blocks from the gallery’s current location. As our neighborhood faces old and new challenges, it seems especially important to revisit Mottel's work and subject matter. SYEUS MOTTEL (b. Bronx, 1930-2014) attended NYU in 1948 and completed both his B.A. and M.A in Theater & Communications. He has been widely published in the New York Times and many other international periodicals. In 1965, Lee Strasberg granted him exclusive permission to photograph at the Actor's Studio. This resulted in a ten year photographic archive of the Studio from 1965-1975. Afterward, he became Media Consultant to R. Buckminster Fuller, with his media documentation of Fuller's activities widely published, including CHARAS: The Improbable Dome Builders (Drake Publishers, Inc. 1973). Additionally, Mottel received many honors for his activities both as a theater director/producer in regional, university, off broadway and off/off broadway venues. THE SONG CAVE is dedicated to recovering a lost sensibility and creating a new one by publishing books of poetry, translations, art criticism, and making art prints and other related materials.